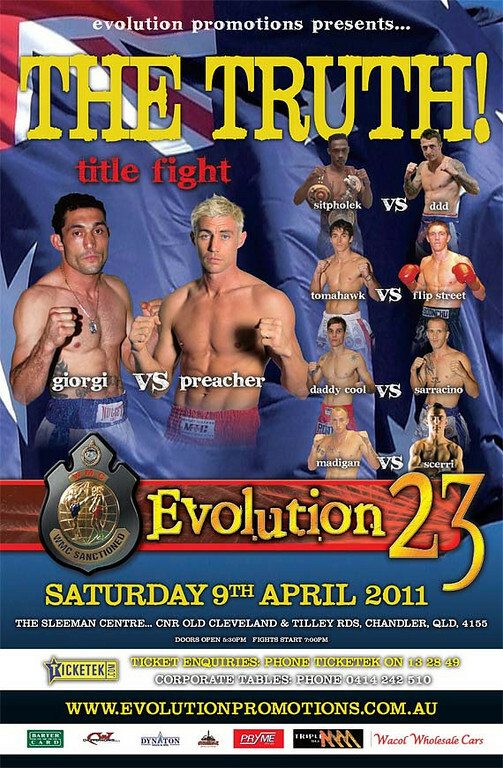 Evolution 23 comes from Brisbane, Australia on April 9th, 2011. And an apparent revenge match is going to be the main event for arguably the longest running and most successful promotion for Muay Thai in Australia. Hosting Evolution 23 will be the Sleeman Sports Centre being the battleground. Billed as the “Truth” the card rematches Frank Giorgi against Bruce “The Preacher” MacFie. In their first bout against one another Giorgi ended the fight with a definitive stoppage that was as shocking as it was swift. To the match makers credit the remaining fights on the card have all the right ingredients to ensure some requiste firewroks are on display on the way to the main event. In the main event Preacher will have something to prove coming off a hard fought fight with Frank Giorgi where the win went to Georgi. Promoters saying the event will be full of fights where punishment will be laid down to the last bell of the last round from fight one through to the main event. Leonard Sitpolek especially caught my attention. Leonard is one of the bigger sized Thai competitors at 79 kg. Leonard is also very decorated having won the World Muay Thai Council (WMC) Championship in2006, the World Association of Kickboxing Organizers (WAKO) championship in Thailand, and the World Professional Muay Thai Federation (WPMF) championship. With an overall 150 fights to his credit, Leonard Sitpholek brings in a very pronounced depth of experience to this event. Definitely a serious challenge for Danny Derdowski himself, a long time World Muay Thai Council light heavyweight champion. Michael “Tomahawk” Thompson will be stepping up to fight Phillip “Flip” Street. Dane “Daddy Kool” Beauchamp will fight Mark Sarracino. Eli Madigan also a rival of Bruce MacFie’s in the past will fight Jason Scerri.